The lights of Vancouver, British Columbia's high rise buildings illuminate the city's skyline as dusk begins to turn into night. 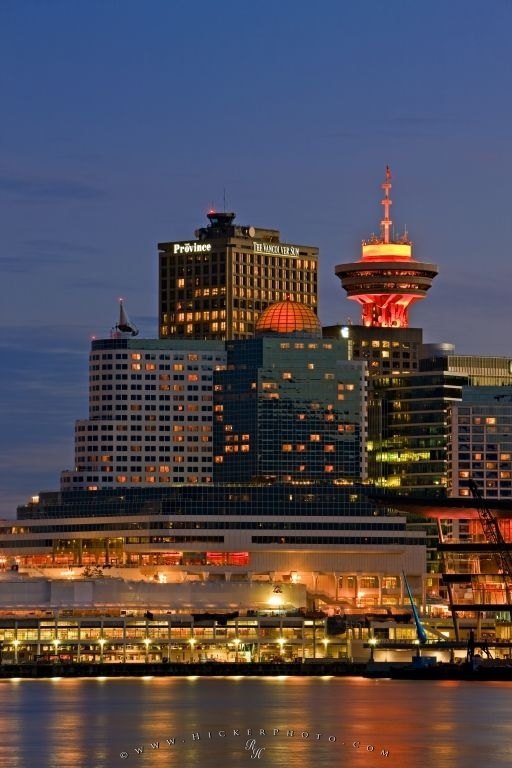 As dusk turns into night, the picture of the lights of the high rise buildings in downtown Vancouver's urban landscape clearly shows how they illuminate the city's skyline. Reflections from the skyscraper towers' lighted windows in the water shimmer in the twilight and as dusk deepens, the many hues of the lights create a kaleidoscope of colour in the waves. making abstract reflections in the water. Pictures from photo gallery "Vancouver Pictures"
This picture is part of the photo album "Vancouver Pictures" - there are more beautiful images waiting for you. ... from coast to coast while communicating Canada Place's role as a Canadian storyteller. Here also at Canada Place, people can promenade along the walkway and watch the luxury cruise liners set sail for Alaska. More than 900,000 people set sail from this point yearly. Vancouver is located in the lower mainland of British Columbia. A culturally diverse, cosmopolitan city, it is the third largest in Canada with a population in the metropolitan area of over 2 million people. Named for Captain George Vancouver who explored and mapped the area in the 1790's, it was incorporated as a city in 1886 and today ranks high in the worldwide list of "livable cities". It is at the doorstep of countless recreational activities in British Columbia's great outdoors and offers visitors many opportunities to enjoy nature either actively or through more leisurely activities. Located in the temperate rainforest, Vancouver's climate is mild by Canadian standards, and the rainy months of November to March contrast with moderate drought conditions in July and August. Winters in the greater Vancouver area are mild, with only 46 days per year on average below freezing. Skyline, Waterfront and high rise buildings in the city of Vancouver at dusk, British Columbia, Canada. I photographed this photo with the digital SLR camera model Canon EOS-1Ds Mark III, aperture of f/10.0, exposure time of 8/1 sec. on ISO 100, as always I used a original Canon Lens, the focus lenght for this picture was 200mm.